Mushrooms are a wild plant that can be delicious when added to salads or tomato sauce, but not all mushrooms are safe to eat. If you live in the Maryland area, it may be tempting to pick mushrooms you find growing in your yard or in a wooded area nearby, but this may not be safe, depending on the species you find. Identifying species of mushroom found in Maryland can help prevent accidental poisoning. Identifying local Maryland mushrooms can prevent accidental poisoning. Black-footed polypores are usually found on decaying deciduous wood between August and December. They grow individually or in groups. These mushrooms are easily identifiable. The caps are usually between 1 1/2 and almost 8 inches wide and are dark reddish-brown. The color gets paler toward the edges. Black-footed polypores are inedible. Their scientific name is Polyporus badius. Autumn skullcaps have small caps, which are usually only 1 1/2 to 2 1/2 inches across. They can be found in forests or natural areas, usually on rotted wood. They grow individually or in small clusters. The autumn skullcap, which is also called the deadly Galernia, is poisonous if ingested. In fact, they are so toxic that they can be fatal if eaten. The scientific name of the autumn skullcap is Galernia autumnalis. The honey mushroom is usually found at the base of deciduous trees or pines or on old stumps. In some cases, the mushrooms behave as parasites by living on live shrubs or trees. The individual caps can grow up to 4 inches across and the stalks are about 3/4 inches wide, and can grow up to 6 inches high. True honey mushrooms are edible, but some people's stomachs can be upset by them. There are also poisonous mushrooms that are very similar in appearance. 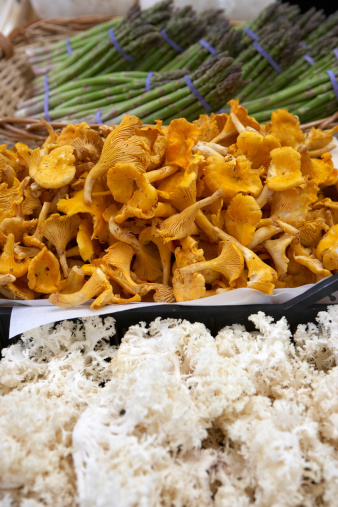 The scientific name for the honey mushroom is Armillariella mellea. These mushrooms look like coral found on the ocean floor, and grow on logs that are well decayed. They are common, and edible, either raw or cooked. The scientific name of these mushrooms is Clavicorona pyxidata. This particular mushroom is only one type of Clavicorona mushrooms. The netted Rhodotus are usually found between June and September on dead deciduous wood, either scattered or in groups. The caps of these mushrooms are 1 to 2 inches across. They are red or pink with white ridges that look like netting over the caps. The stalks are around 1 to 2 inches thick and measure 1 to 2 inches long. Netted Rhodotus are not a common type of mushroom, and it's unknown if they're edible. The scientific name of the netted Rhodotus is Rhodotus palmatus. Where Do Wild Huckleberries Grow?